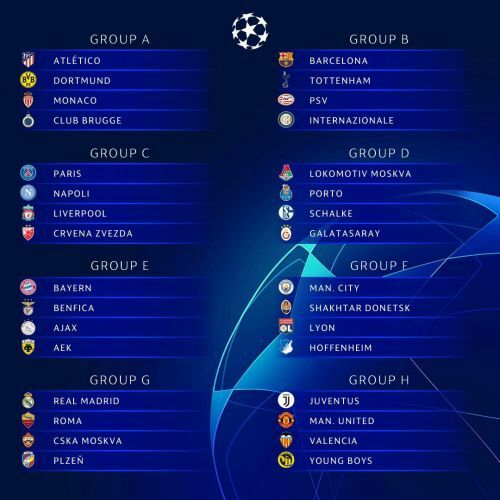 The Champions League draw for the 2018/2019 season was conducted in Monaco and threw up some potentially exciting match-ups. While some fans will look at their team's opponents and start preparing for the knockout stages, the majority of groups are not so straightforward. There will be a couple of heavyweight clashes early on in the competition and some intriguing storylines. Cristiano Ronaldo and Paul Pogba will come up against the teams with which they made their names when Juventus play Manchester United. Paris Saint-Germain vs Liverpool will see two of Europe's most electrifying trios go head-to-head. Tottenham, on their part, will look to move past three former European champions: Barcelona, Inter Milan and PSV Eindhoven. We take a look at the teams that are most likely to proceed from each of the eight groups bearing in mind the quality of the teams, recent performances and experience among other factors. Atletico Madrid should prove to be too much for the rest of their Group A opponents based on their experience in Europe and the caliber of players within the squad. The Europa League champions boast the likes of Antoine Griezmann, Diego Costa and Diego Godin who possess quality and a winning mentality. Diego Simeone's side will also be seeking to perform better this season after an underwhelming Champions League campaign last season. Loan signing Paco Alcacer from Barcelona will be expected to provide the goals that will propel Borussia Dortmund back among Europe's elite. The striker will play alongside the likes of Marco Reus, Christian Pulisic and Axel Witsel which should be enough for head coach Lucien Favre to mastermind progress to the knockout rounds. Monaco and Belgian champions Club Brugge will provide stiff competition. However, with the French club having sold most of their prized assets in recent seasons and the Belgian club lacking experience at this level, it is unlikely the two teams will unseat the group favorites.